Citation: Galindo-Ferreiro A, Elkhamary SM, Alkatan H, Maktabi A, Galvez-Ruiz A, et al. (2016) Orbital Castleman’s Disease: Tertiary Eye Center Experience and Radiological Characteristics. Arch Inflamm 1:1. Copyright: © 2016 Galindo-Ferreiro A, et al. This is an open-access article distributed under the terms of the Creative Commons Attribution License, which permits unrestricted use, distribution, and reproduction in any medium, provided the original author and source are credited. Castleman’s disease (CD), also known as angiofollicular or giant lymph node hyperplasia, is a rare atypical lymphoproliferative disorder of unknown etiology characterized by a “regressed” germinal center and capillary “proliferation” . CD has been initially described in 1954 and the mediastinum is the most common site of occurrence . Clinically the disease can be recognized as a tender, well-defined lesion and classified as unicentric, or multi-centric . Eye or adnexal involvement in CD is extremely unusual. Ophthalmic involvement has been reported in four cases in the literature [3-6]. There have been less than 15 cases in the literature of orbital involvement by CD. The first published orbital case described bilateral, multi-centric CD, with systemic involvement . However, this case was not confirmed by biopsy. Another case of biopsy confirmed orbital CD was reported in a 12-year-old female with a unilateral lesion and proptosis that remained quiescent for 2 decades after initial presentation . We report two cases of orbital CD that, to the best of our knowledge, are the first reports including diffusion-weighted magnetic resonance imaging (DW-MRI) in the description of this disease. A 38-year-old female presented in 2008 complaining of progressive left eye proptosis that began seven years earlier (Figure 1A). Computed tomography (CT) showed a solid orbital mass located mainly in the inferonasal compartment of extraconal left orbit involving the medial and inferior rectus with prominent enhancement after contrast. Her left optic nerve was mildly compressed. 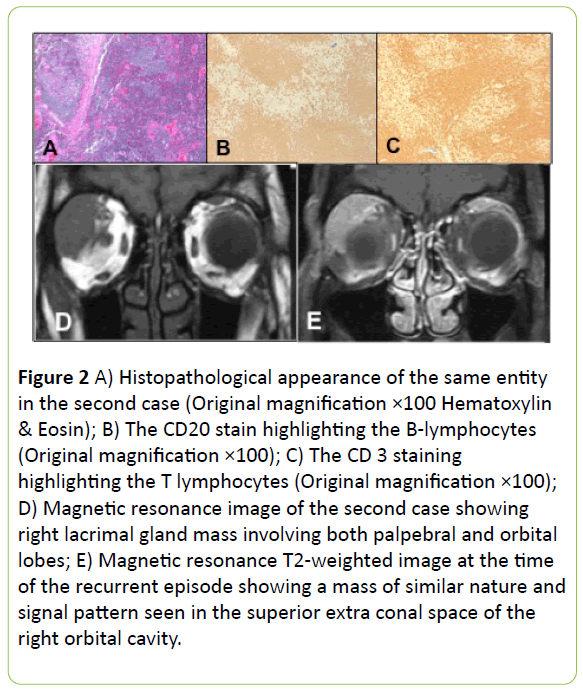 Figure 1 A) Clinical picture of case 1 with unilateral left proptosis; B) Histopathology showing angiofollicular lymphoma of plasma cell type (Original magnification ×200 Hematoxylin & Eosin); C) The lymphoplasmacytic infiltrate showing orbital fat invasion (Original magnification ×100 Hematoxylin & Eosin); D) The infiltrate showing positive lymphocytic cells with CD3 IHC stain (Original magnification ×100 CD3); E) Follow up Axial T2 non-fat suppression magnetic resonance imaging (MRI) image showing infiltrative pattern of this mass with forward displacement of the globe; F) Axial post contrast fat-sat T1W MRI image showing the same mass infiltrating the intra/extra-conal, retro-orbital fat, and surrounding the extra-ocular muscles as well as the optic nerve, eyelid, and orbital fat. The patient underwent an incisional biopsy of the affected tissue through a left upper lid crease incision. The histopathological sections showed lymphoid follicles with hyperplastic germinal centers. The Interfollicular zone was characterized by the presence of mature plasma cells, large follicles and rare vascular stroma. The pathologist concluded the diagnosis of the plasma cell variant (PCV) of CD plus mixed type affecting the orbit (Figure 1B-1D). The patient was referred for chemotherapy. In 2015, she developed progressive proptosis on the left side (IC 104 mm, OD=25 mm/OS=30 mm). The patient had dystopia of the left eye, 3 mm of lagophthalmos, restricted extra-ocular motility of the left eye and incomplete closure of his eyelids. Both corneas showed superficial punctate keratopathy that was more pronounced in the left eye. Multiple palpable lymph nodes were found in the neck. Repeated magnetic resonance imaging (MRI) with contrast enhancement showed significant proptosis of the left globe and a multi-compartmental soft tissue mass occupying most of the left orbital cavity, encircling the optic nerve within the extra-conal space and involving the orbital pre-septal tissue (Figure 1E,1F). Another intra-orbital lesion was observed extending into the left lateral nasal fossa, very close to the left lacrimal sac, without extending into it. Image maps of the apparent diffusion coefficient (ADC) showed restricted pattern with low ADC value (0.58 × 10-3 sec/mm2). The right globe was mildly proptotic and the right lacrimal gland was enlarged with evidence of periocular soft tissue thickening and minimal fullness of the right pre-septal space. The underlying bones were normal. Clinically, a recurrent tumor or activation of the CD was suspected and the patient was referred again for systemic assessment and treatment. A 40-year-old female presented in 2007 complaining of left eye proptosis and upper lid swelling of 1 year duration. Ophthalmic examination revealed lacrimal gland enlargement and exophthalmos (IC 95 mm, OD=19 mm/OS=22 mm). CT indicated bilateral asymmetrical lacrimal gland enlargement. The patient underwent left lateral orbitotomy and excisional biopsy of the lacrimal gland. The histopathological sections showed significant number of abnormal lymphoid follicles with atrophic germinal centers, which were rich with dendritic reticulum cells. Prominent interfollicular vascular proliferation and hyaline material storage were also found. The overall findings were consistent with the hyaline vascular variant (HVV) of CD (Figure 2A-2C). The patient underwent extensive studies, which have indicated chest, abdomen, and neck lymph nodes involvement. The patient was diagnosed with multi-centric CD and referred for systemic treatment. One year after the initial presentation, the patient presented with increasing right proptosis with no diplopia. The examination revealed 2 mm right exophthalmos (IC 95 mm, OD=21 mm/OS=19 mm). MRI indicated a right lacrimal gland mass lesion involving both the palpebral and the orbital lobes measuring approximately 3.5 cm × 1.8 cm. Castleman’s disease (CD) is a rare lymphoproliferative disease characterized by massive growth of lymphoid tissue, follicular hyperplasia, vascular proliferation, and plasmacytosis. We are presenting two cases of CD affecting the orbit, which is a rare location for this entity. All suspected cases of lymphoma have been evaluated in our institution. The review reported 40 cases with ocular/periocular involvement distributed as follows: conjunctiva (42.5%), orbit (25%), lacrimal gland (12.5%), eyelid (10%), lacrimal sac (7.5%) and caruncle (2.5%) . Additionally, the investigators at the same institution found 3 cases only (7.5%) that were classified as CD . Orbital CD tends to affect males aged 17 years to over 70 years old [2,9-11]. However, in the current report both cases were female and approximately 40-years-old. Clinical manifestations of adnexal involvement of CD depend on the location of the lesions. Both our cases manifested with proptosis, which is the most common clinical manifestation of orbital CD [10,12]. Case 1 in our report presented with unilateral proptosis but further examination indicated nasal extension and the lacrimal gland was affected on the other side with involvement of the neck lymph nodes. These signs indicated that the disease was not restricted to one orbit, which is consistent with previous reports [10,12]. Case 2 presented with bilateral proptosis but not simultaneously. Orbital lesions can manifest by globe displacement and proptosis and eyelid lesions can induce ptosis. Conjunctival lesions are salmon colored, located in the fornix, caruncle or epibulbar space and they do not cause diplopia or globe displacement . Commonly, orbital CD is unicentric and generally mild whereas multi-centric cases can be associated to systemic disease as our both patients and can have worse prognosis [3,14]. The gold standard confirmation of the diagnosis is excisional biopsy and histopathological examination to confirm the pattern that clearly defines three types of CD: hyaline vascular, plasma cell, and mixed (transitional) cell type . Recently, a new classification has been proposed based on histopathological findings, separating CD into four subtypes : 1) Hyaline vascular variant (HVV) involving lymph node follicles with small lymphocytes distributed in widened mantle zones and resulting in concentric rings (with an "onion skin" pattern) that surround small atrophic or "regressively transformed" germinal centers; 2) Plasma cell variant (PCV) in which the histological findings are not specific for CD and are similar to other diseases such as rheumatoid arthritis and viral lymphadenitis. The germinal centers in the PCV are hyperplastic instead of regressively transformed and the inter-follicular region of the node is vascular and contains sheets of plasma cells that are characteristically polyclonal; 3) Multi-centric Castleman’s disease (MCD) with histopathological findings, which most closely resemble PCV and may include a mixed histology with preservation of lymph node architecture, intact and dilated sinuses and para-cortical hyperplasia with prominent vascular proliferation; 4) Plasmablastic variant or HHV-8 associated CD and a multi-centric CD-not otherwise specified (NOS), which is most frequently associated with HIV infection. Ninety per cent of the orbital CD cases are HVV type, which are asymptomatic, restricted to the intra- or extra- conal orbital space with no systemic involvement and rarely associated with lymphoma [11,14-16]. In the current report, Case 1 was identified as PCV and Case 2 as MCD. PCV CD is more aggressive compared to HVV and 90% of the multi-centric cases are PCV. PCV is a systemic disease with symptoms that include chills, fatigue, anorexia, significant weight loss, frequent fever, night sweats, generalized peripheral multifocal lymphadenopathy, hepatosplenomegaly, edema, ascites, pleural or pericardial effusions, skin rashes and frank central nervous system symptoms. The aggressive behavior can be associated to serious systemic involvement and is usually fatal due to fulminant infections or related malignancies, particularly Kaposi’s sarcoma and lymphomas . Differential diagnosis includes rheumatologic diseases and viral infections. Anemia, thrombocytopenia, elevated erythrocyte sedimentation rate, hypoalbuminemia, abnormal liver function test results and a polyclonal increase in immunoglobulin, renal failure and excessive IL-6 . CT-scan and MRI show solid masses with an infiltrative pattern. The ADC value of the mass was very low with a restricted pattern on diffusion-weighted images, which may mimic infiltration masses associated with the presence of lymphoma. CD can be controlled with early intervention such as standard therapy for lymphoproliferative diseases, including surgical excision and adjunctive chemotherapy and radiation therapy [17,18]. Systemic treatment is required for the multi-centric form to ensure all affected sites are treated, similar to our cases. Treatment includes corticosteroids, chemotherapy, or immunotherapy. A combination of these methods may be required in an attempt to cause remission of the disease and follow up of these cases clinically and radiologically is recommended since the malignant potential must be kept in mind [1,14]. Despite the possibility of a systemic disease, the overall prognosis for ocular adnexal lymphoid tumors is general good. When grouped together, 67% of these tumors are not associated with systemic disease with mean follow-up of over four years. Lesions affecting the orbit have an intermediate prognosis between conjunctival lid lesions which have the worst prognosis . While the unicentric form can be cured with surgical excision, surgery usually is not an option for multi-centric CD due to the number of lymph nodes involvement hence the worse prognosis in these cases. In conclusion, our two cases presented with CD affecting the orbits with systemic involvement. Physicians should always consider the possibility of orbital involvement by CD. Despite the rare occurrence, this disease often has extensive systemic involvement and a multi-disciplinary approach is warranted to achieve good patient outcomes. Erkurt MA, Aydogdu I, Kuku I, Kaya E, Mizrak B, et al. (2009) A multicentric, hyaline vascular variant of Castleman's disease associated with B cell lymphoma: a case report. Cases J 2:8183. Castleman B, Towne VW (1954) Case records of the Massachusetts General Hospital: Case No. 40231. N Engl J Med 250:1001-1005. Kozak I, Reid EG (2013) Retinal vein occlusion during flare of multicentricCastleman's disease. ClinOphthalmol 7:1647-1649. Park KS, Choi YJ, Song KS (2002) Hyaline-vascular type Castleman's disease involving both orbits. A ActaOphthalmolScand 80:537-539. Kim U, Hwang JM (2010) Optic neuropathy associated with Castleman disease. Korean J Ophthalmol 24:256-259. Kurokawa T, Suzuki S, Kawaguchi K, Fujisawa N, Yoshimura N, et al. (1999) Castleman disease presenting with ophthalmic signs and symptoms. Am J Ophthalmol 128:114-116. Alyahya GA, Prause JU, Heegaard S(2002) Castleman's disease in the orbit. A 20-year follow-up. ActaOphthalmolScand 80:540-542. Alkatan HM, Alaraj A, El-Khani A, Al-Sheikh O (2013) Ocular adnexal lymphoproliferative disorders in an ophthalmic referral center in Saudi Arabia. Saudi J Ophthalmol 27:227-230. Inatani M, Kashii S, Nosaka K, Arima N (2005) Orbital pseudotumor as an initial manifestation of multicentricCastleman's disease. Jpn J Ophthalmol 49:505-508. Janez L, Taban M, Wong CA, Ranganath K, Douglas RS, et al. (2010) Localized IntraorbitalCastleman's disease: a case report. Orbit 29:158-160. Venizelos I, Papathomas TG, Papathanasiou M, Cheva A, Garypidou V, et al (2010) Orbital involvement in Castleman disease. SurvOphthalmol 55:247-255. Jakobiec FA, Knowles DM (1989) An overview of ocular adnexal lymphoid tumors. Trans Am OphthalmolSoc 87:420-442. 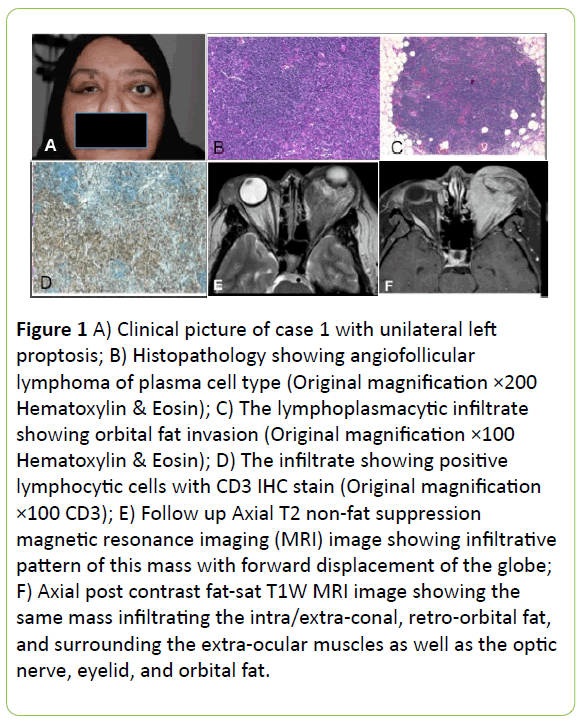 Kang D, Lee J, Lee H, Baek S (2015) UnicentricCastleman's disease in the orbit: A case report. Indian J Ophthalmol 63:555-557. Jones NW, Fountain TR, Thakral B, Eldibany M (2014) Castleman's disease in the orbit of a 17-year-old girl: a case report. OphthalPlastReconstrSurg30:17-20. Mukherjee B, Alam MS, Krishnakumar S (2014) A rare case of bilateral orbital Castleman disease. Orbit 33:314-317. Saeed-Abdul-Rahman I, Al-Amri AM (2012) Castleman disease. Korean J Hematol 47:163-177. Snead MP, James JN, Snead DR, Robson DK, Rizk SN, et al. (1993) Orbital lymphomas and Castleman's disease. Eye 7:84-88.